Parging is a finishing process that uses a masonry based mortar to shield the vulnerable areas of a building’s exterior, like where an exterior foundation wall meets the ground. Parging protects your home or business from damage from snow, ice, and water. Most often, when dealing with existing parging, the recommendation of parging experts will be to remove the old application and start fresh with a new layer. This ensures the best seal and is the most attractive option. With freeze and thaw cycles like those we see in Edmonton every year, you need to protect your building for many years to come. Parging can go beyond the bottom of the building. J and J Coatings can provide attractive smooth or textured parging finishes for all surfaces of your home or business. We’re perfectionists and parging experts. We pride ourselves on work that is as beautiful as it is effective. Parging is an affordable way to covers cracks, repair leaks or water damage, and fill holes or voids, even inside the building. A fresh application of parging can improve a home’s energy efficiency by sealing small air leaks. It can also repair damage to existing exterior walls or columns. In short, parging is a versatile material that works on any vertical stone, brick, or concrete surface. J and J Coatings will work with you every step of the way with expert guidance to help you find the solution that works best for your home or business. Contact us today to get started. Whether it’s the sudden and unfortunate discovery of a brand new leak in your basement or the aesthetic horror of cracks in your existing parging, repairs are a fact of life. A small crack in the parging of your home or business is like a small rattle in your car. The first instinct is to ignore it and hope for the best. Like your car, you ignore that warning sign at your peril. 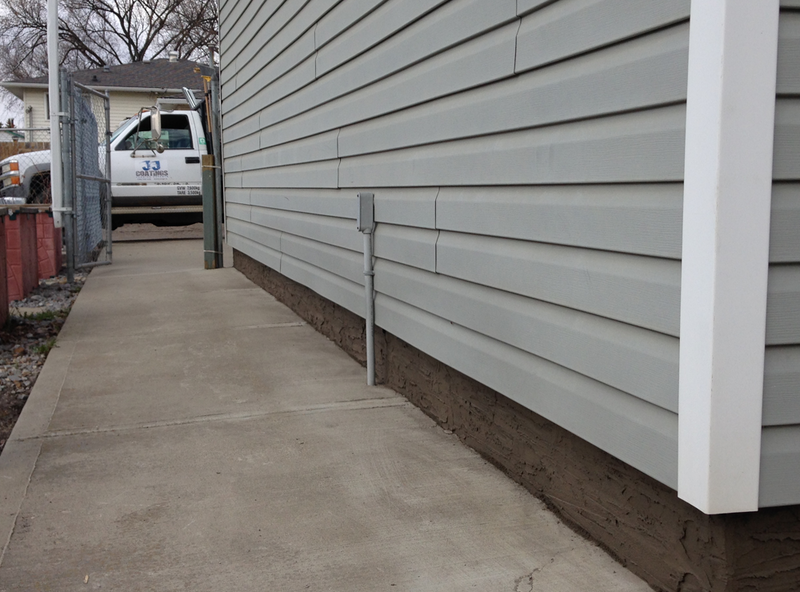 When your parging fails, rain or snow can get into the building envelope and cause even more damage. While it’s true some cases of failure stem from a bad parging installation or defective materials, every building and every problem is unique. It may be tempting hack together a DIY solution you found on YouTube for your parging repairs, but this is a job best left to the pros. Even if you manage something pleasing to the eye when you’ve done it yourself, a professional parging repair will help protect your home or business. Better still, a professional parging repair can blend in with the existing finish so that your parging repairs are barely visible to the naked eye. You may even consider parging basement walls to add a more finished look. No matter what the problem is with your parging, you need to work with parging experts to identify the cause and identify the best course of action to protect your home or business from further damage. J and J Coatings will give you the facts to make an informed decision, and then implement solutions with respect and professionalism. Give the parging experts at J and J Coatings a call to get started. Learn more about our company, our services, and what parging can and cannot do around your home on our supplementary service pages: How to Repair Parging; Edmonton Parging Contractor; Parging Basement Walls, and Stucco Repair Edmonton.